Professor Caroline Taylor was honored by an invitation to provide a key address at the 29th World Meeting of Interpol’s Specialist Group on Crimes Against Children held at Interpol’s European headquarters in Lyons, France in early September 2011. The meeting is by invitation only and Professor Taylor presented a key address to the meeting as well as workshop/seminar. Her paper will be published on Interpol’s intranet site. Professor Taylor said she felt very privileged to be invited to speak to a world gathering of such dedicated, passionate and specialist police who are devoted to tackling the horrendous crimes of sexual and physical violence, exploitation and trafficking of children around the world. Over 200 Interpol members representing nearly 60 countries attended the World Meeting where interpreters translated presentations into 5 languages. Professor Taylor was hugely impressed by the ongoing work and projects currently underway by Interpol police whilst acknowledging the challenges that remain. Interpol police are among the best specialist police practitioners in the world and they work proactively with some of the world’s leading academics in collaborative efforts against the shocking crime of child abuse. Professor Taylor has been invited to become a part of Interpol’s Specialist Group in her academic role and regards this as a huge privilege to help support and advance the important work and research of this global police organisation. 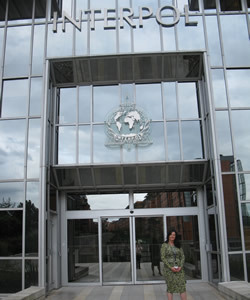 Professor Taylor at the European Headquarters of Interpol in Lyon, France in September 2011.